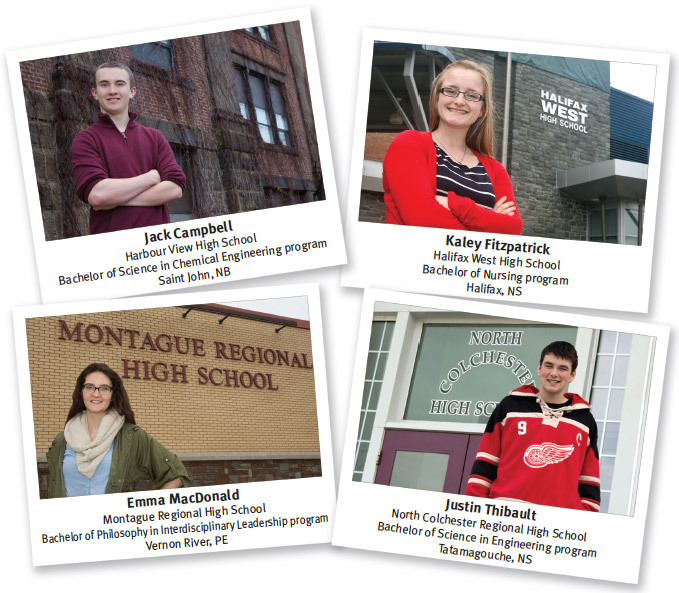 Four Maritime high school students who display outstanding leadership skills inside and outside the classroom are the 2014-15 recipients of the prestigious Currie Scholarships at the University of New Brunswick. The Currie Scholarships were established by Dr. Richard J. Currie, one of Canada’s most accomplished business leaders and philanthropists. Jack Campbell of Saint John, New Brunswick, Kaley Fitzpatrick of Halifax, Nova Scotia, Emma MacDonald of Vernon River, Prince Edward Island, and Justin Thibault of Tatamagouche, Nova Scotia will each receive the four-year scholarship, valued at $50,000. Jack Campbell combined athletic skills developed in football and rugby with performing abilities in Harbour View High School’s recent musical while maintaining a high academic standard. He will pursue a Bachelor of Science degree in Chemical Engineering. Kaley Fitzpatrick is heavily involved in community and charity organizations at Halifax West High School, where she participated in many extracurricular activities, including the school’s World Involvement Committee, musical production and yearbook committee. She will enrol in the four-year Bachelor of Nursing degree. Emma MacDonald is a top athlete and student leader at Montague Regional High School. In addition, she is a member of numerous student organizations, including Encounters with Canada and the Canadian Student Leadership Conference. She will be entering the Bachelor of Philosophy in Interdisciplinary Leadership program. Justin Thibault, a licensed private pilot, displays leadership experience as student council president at North Colchester High School and is an active community volunteer while participating in hockey and soccer. He will enter the Bachelor of Science in Engineering program this fall. The scholarships, now celebrating over a decade, are a legacy of UNB’s chancellor emeritus and the University’s most generous living benefactor. Dr. Currie has been an inspirational leader for the University, its officials, faculty and students, and his entrepreneurial spirit has set a standard few have surpassed.